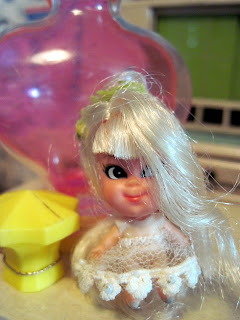 Found at a recent toy show, this Kiddle Kologne doll is so sweet! 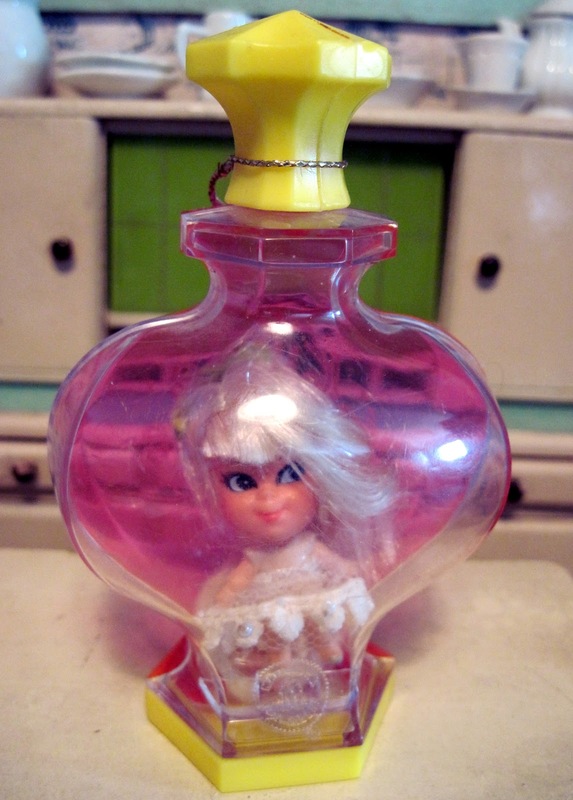 Made by Mattel between 1968-1970, it's from a whole line of scented mini dolls housed in plastic cologne bottles. The wee little vinyl doll is just 2 inches tall, while her bottle home measures a roomy 5 inches. 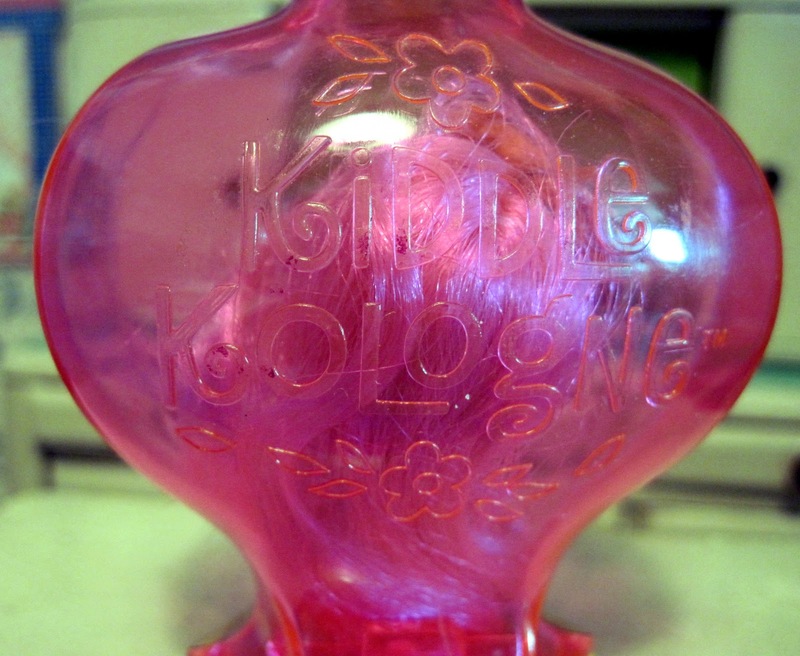 This particular variety is Lily of the Valley, and while this isn't her correct bottle (there were different color combinations), she was still a steal at just a couple of bucks. 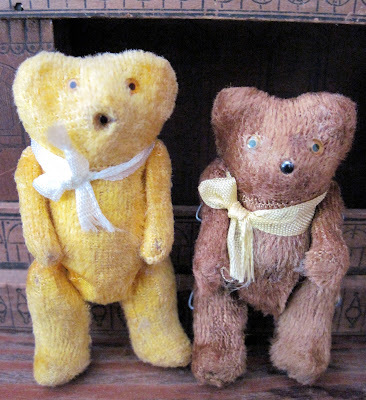 Learn more about the Kiddle Kolognes (and some of their friends and relations) here. ...and out of her bottle. Back of the bottle, marked "Kiddle Kologne". 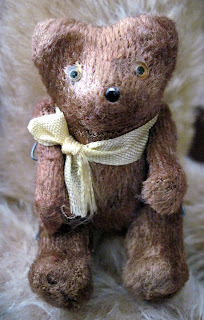 Spotted at a recent toy show in a tray of miscellaneous smalls was this miniature teddy bear, just 3 inches tall. Bears like these were made in Japan from the 1930s-50s, and sold in dime stores and penny candy shops. They're not stuffed in the traditional way. 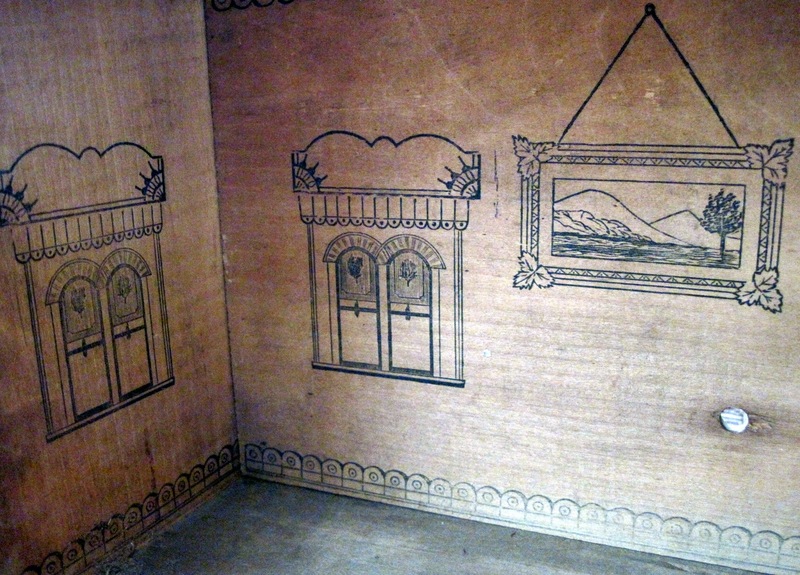 Instead their velveteen fabric is glued over a molded composition or cardboard body. 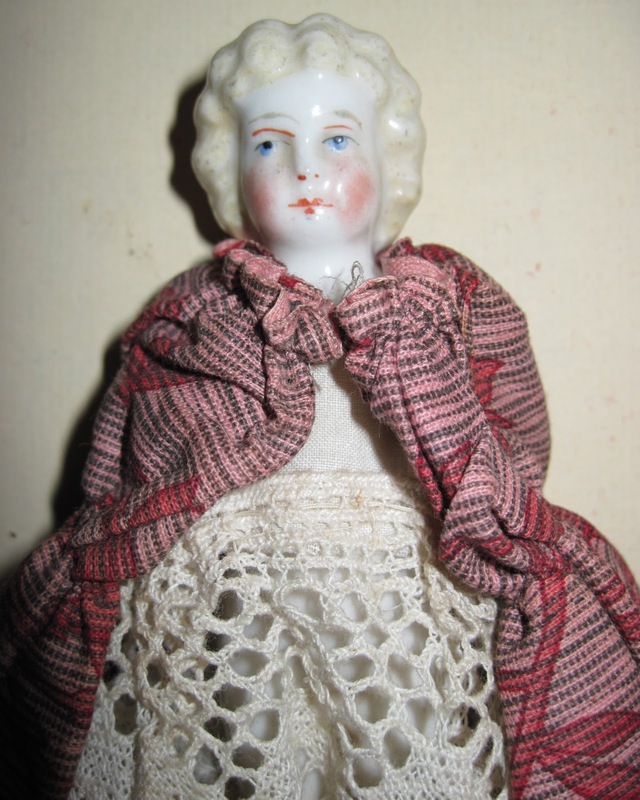 They have tiny glass eyes and bead noses, and often still retain their original ribbons when found. Gold is the most frequently seen color; this brown one is a rarity. 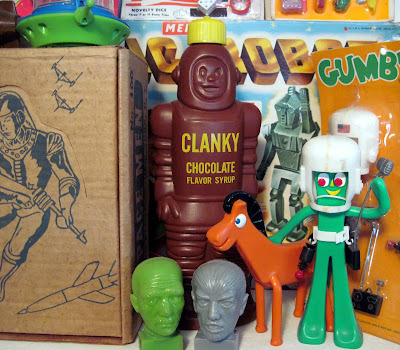 One of our favorite toy shows takes place every January. Each year at this event I seem to find lots of one particular kind of toy, as if an unplanned theme runs through the show. 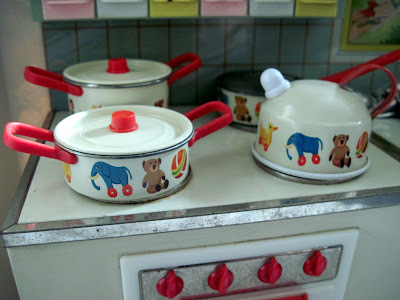 For example, one year I found lots of vintage cereal premiums; the next year, it was robots; after that, old dollhouse dishes and tables. This year's show turned up loads of vintage trolls, very early ones made by Dam of Denmark in the 1960s, along with a couple of rarities. It was a veritable Trollapalooza! The first finds were these two very early Dams, made in heavy European vinyl with glass eyes. The larger troll is the seldom-seen 5 inch size, and retains her original clothes and hair bows. Her mohair wig seems to have begun separating itself into dreadlocks. The next finds included another 5 inch Dam, this one with short hair (which some early Dams did have), wearing a sweater lovingly knitted by his original young owner. A troll biology tip---this one is a boy: you can tell by the pointy ears. 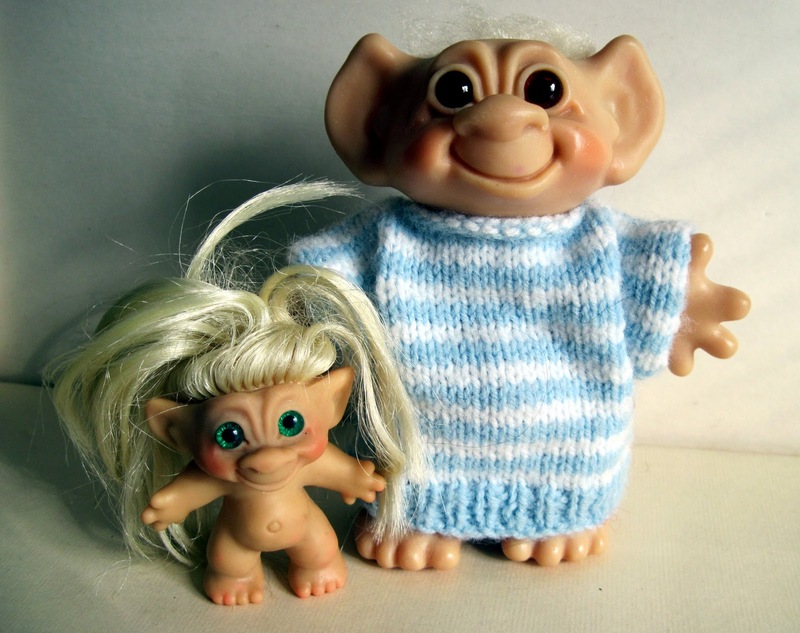 Dam girl trolls have round ears (see above). 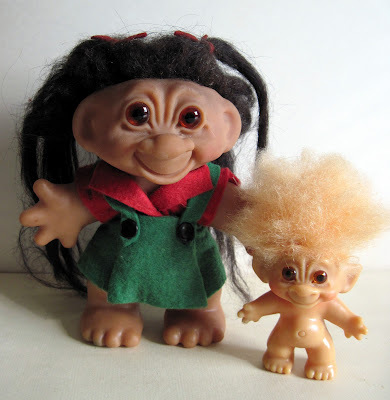 A particularly fine rooted hair troll. 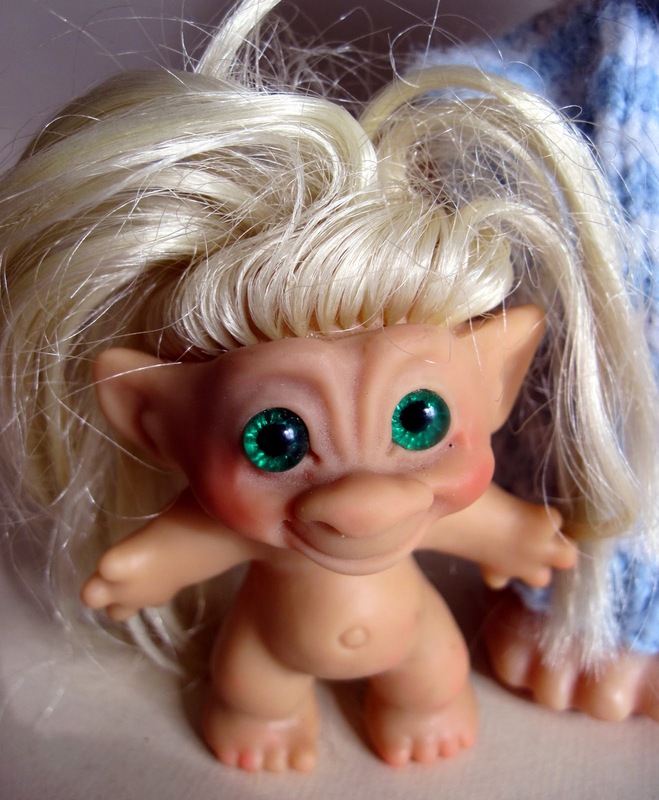 At a nearby table the smaller 2 1/2 inch troll was spotted, a scarce rooted hair version with fabulous long locks and premium quality eyes. 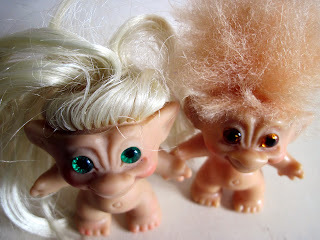 What is a rooted hair troll? Well, most trolls were manufactured with swatches of mohair simply shoved and glued into their hollow head cavities. This was quick and therefore cheap, but not particularly secure. Rooted hair trolls had their hair inserted strand by strand through the vinyl, the same way a doll's hair is rooted. 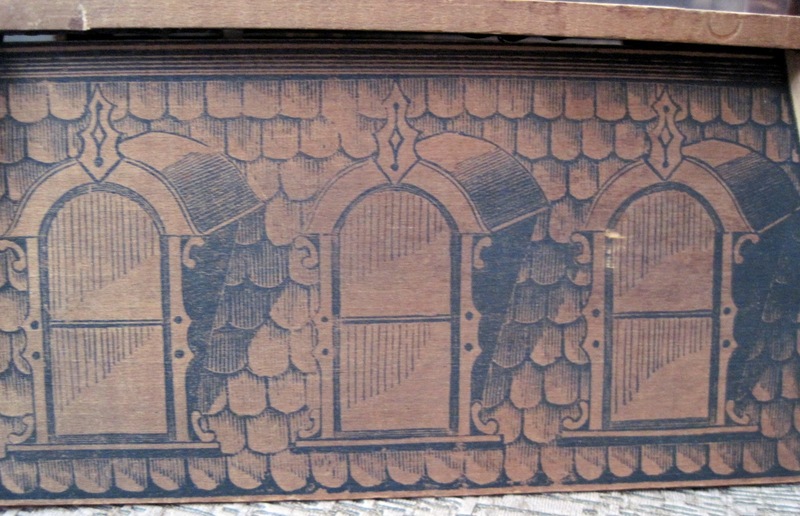 This made the hair very secure, but it also made the manufacturing process much longer and more expensive. 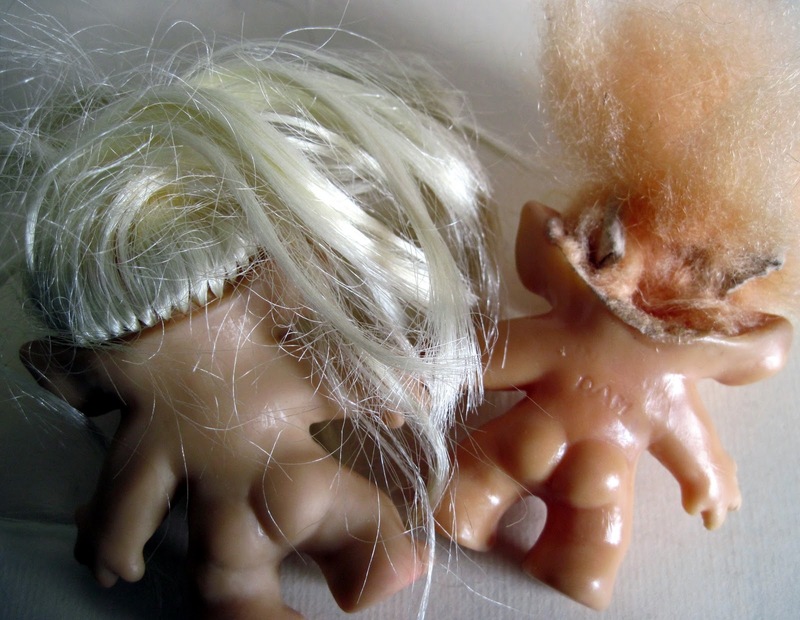 Soooo...not a lot of rooted hair trolls were made, and if you find one, you should definitely scoop him (or her) up. These photos give a clearer sense of the difference between the two troll hairstyles. My last find was an odd, rarely seen toy that was a knock-off version of the popular trolls. Itty Bitty Fings were made by Diener Industries of Sepulveda, California, in the early '60s. 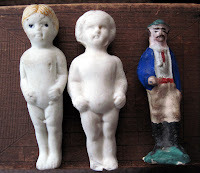 About 1 1/2 inches tall, the Fing is made from a rubbery substance similar to old pencil erasers. The hair is mohair, glued to the Fing's head. 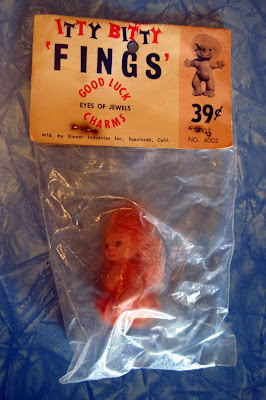 There were several different styles of Fings, all rather creepy looking. 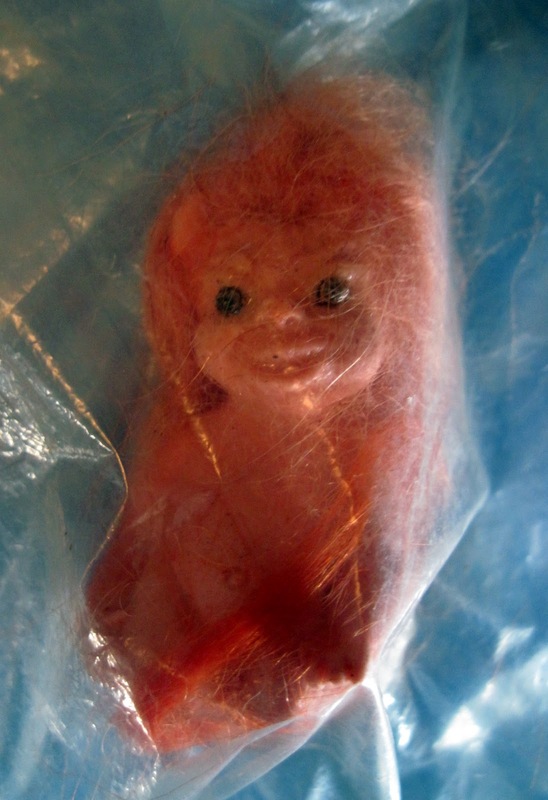 This one is still in his original bag...and he'll probably stay there, as he makes me a bit nervous. 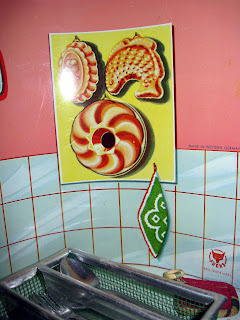 I found this 1950s-early '60s kitchen playset at a recent toy show. 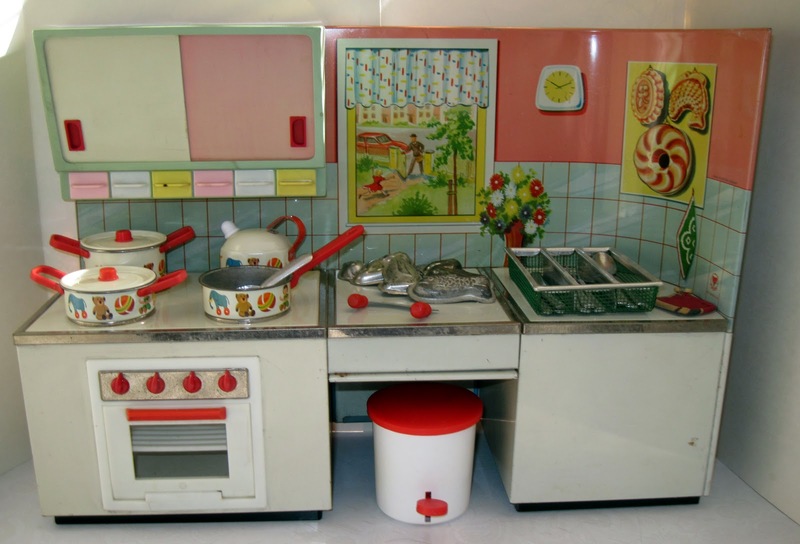 Made in Western Germany by Fuchs, the 16 inch wide kitchen features fabulous mid-century design elements, including a very fashionable salmon pink and turquoise blue color palette. 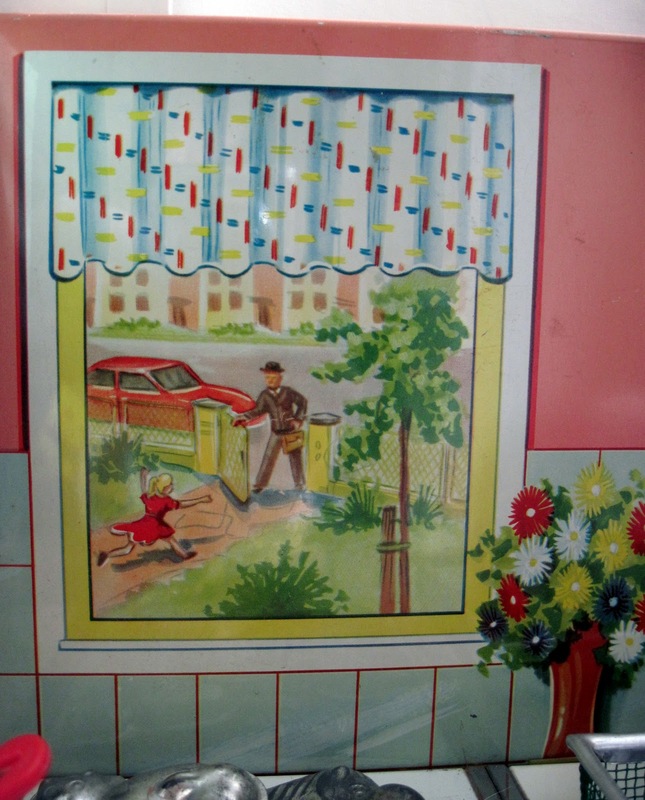 One of my favorite features is the printed-on window, which reveals a scene of a father arriving home from work, his vintage automobile parked just outside the gate. 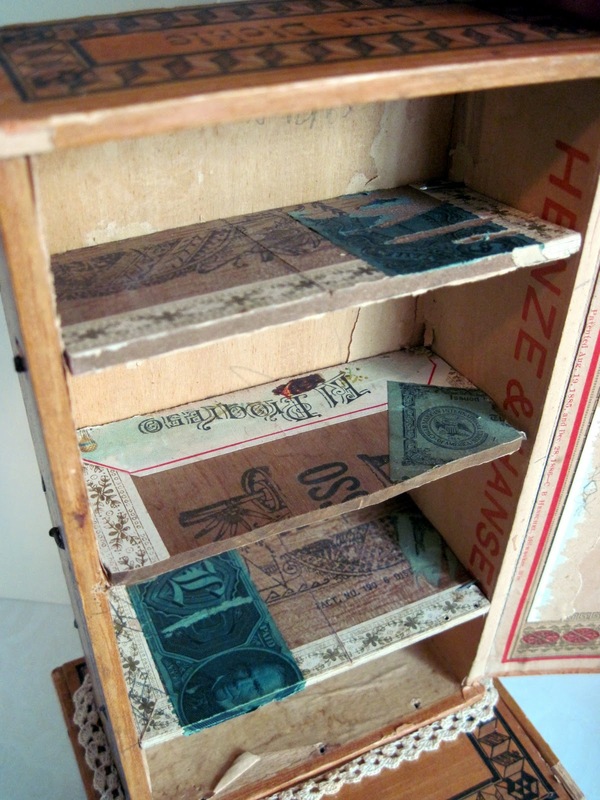 The cupboard doors above the stove slide open, revealing tiny canisters filled with printed paper food. The little drawers under the cupboard slide open, too. 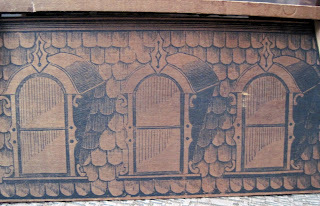 The copper mold forms, found in German toy kitchens all the way back to the 1700s, are in this case printed onto the wall above the counter. 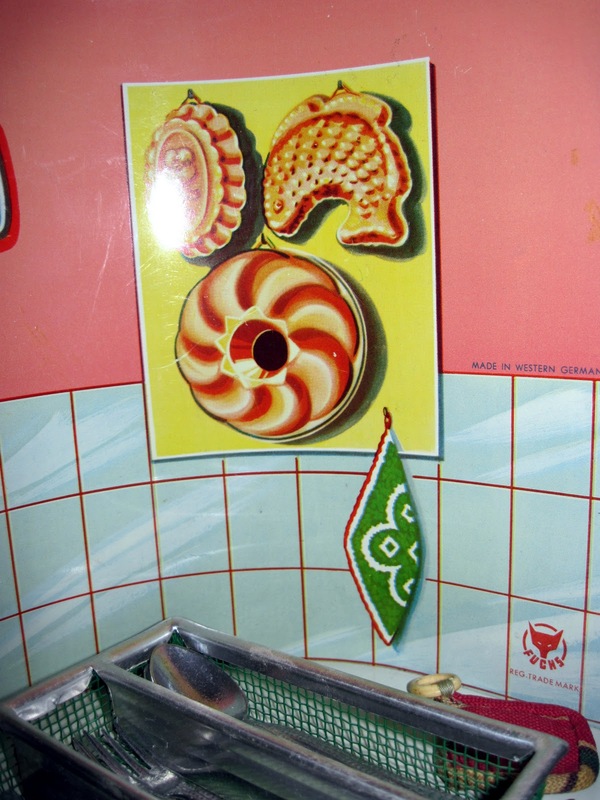 An assortment of real miniature molds cover the countertop. 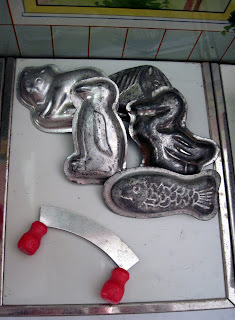 These could actually be used to make such things as little chocolates or gelatins. A teeny tiny mezzaluna lies beneath the molds, useful for chopping herbs. 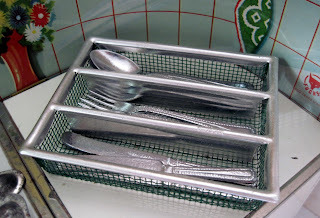 A basket of miniature flatware, each piece stamped "Germany", rests on the counter. 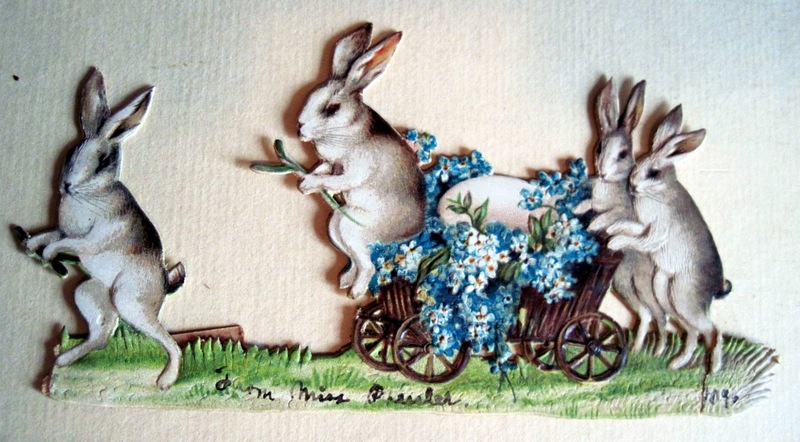 They are quite delicate, and amazingly in perfect condition. The stove top hosts the most adorable set of miniature cookware I've ever seen: pots and pans decorated with images of tiny toys. 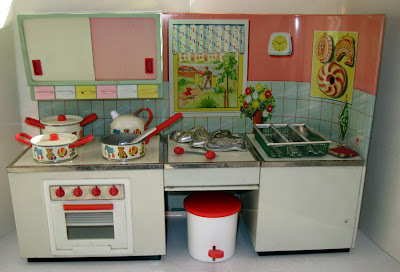 The kitchen set was a great find: such playsets by this maker are highly sought items. 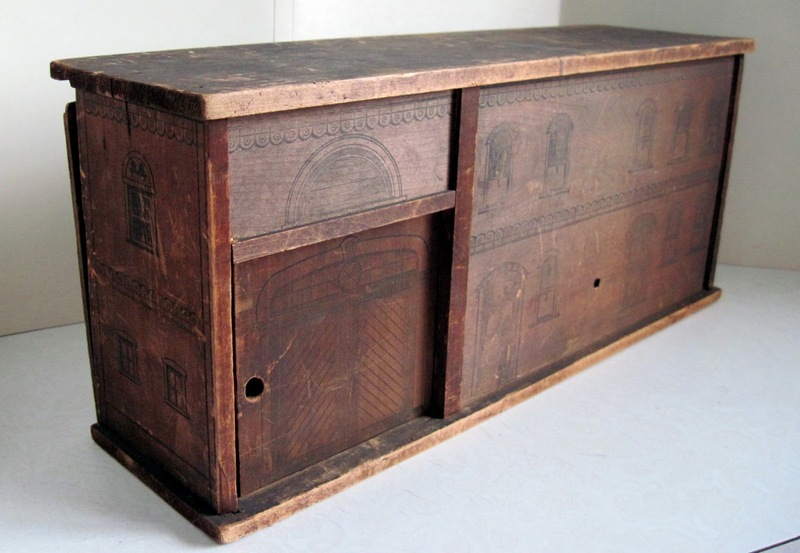 But the price made it a fantastic find: only $25! I was hopping up and down with glee once I spotted the price tag. 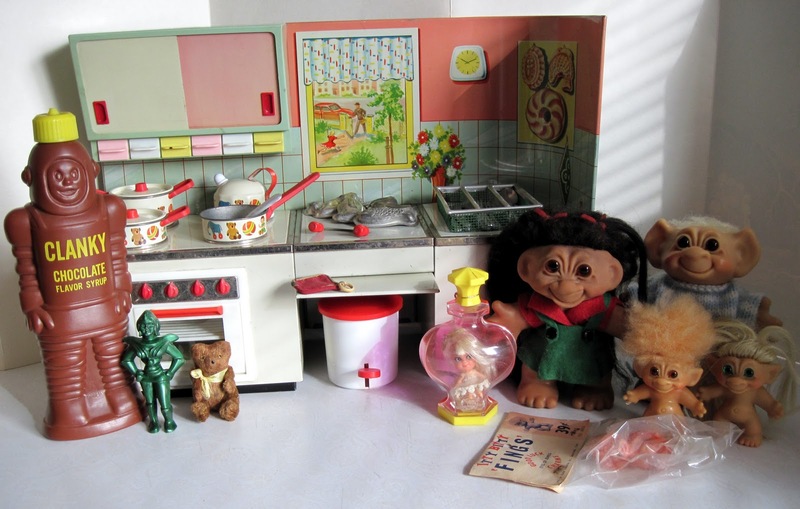 Typically kitchens like this sell in the $100+ range. 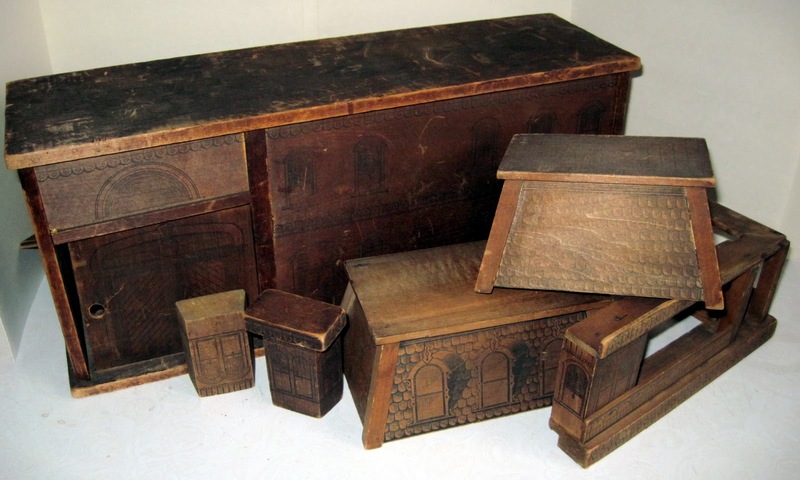 Some of the accessories alone (the silverware tray, the mezzaluna) sell for more than $25 apiece from dollhouse and miniature dealers. It was the best bargain of the whole toy show! 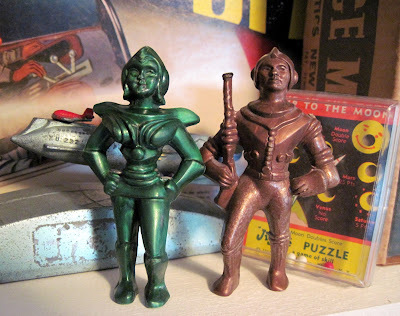 If you've read this blog for awhile, you'll know that I have a thing for Archer Space Men, absolutely fantastic little 4 inch plastic figures sold in dime stores in the 1950s. If you haven't been reading this blog for awhile, you can catch up on the Archer Space Man posts by clicking here and here and here. Anyway, the Archer Space Men had a couple of female companions, the Archer Space Women. 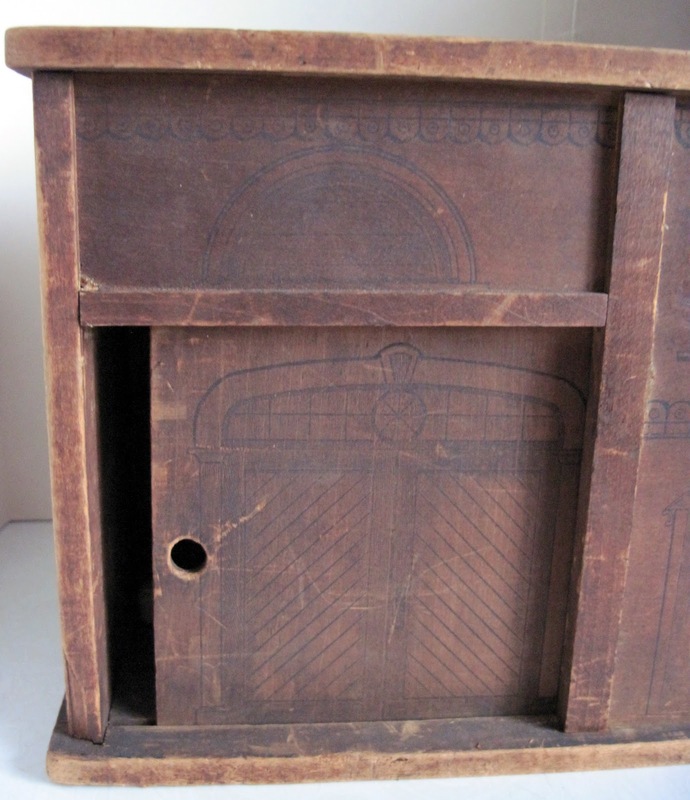 They're rather scarce today: it appears the women weren't manufactured in nearly the same amounts as the men, probably on the assumption that they wouldn't be as popular with the target audience of little boys. I've kept an eye out for one for several years, but had nary a sighting until this one turned up at a recent toy show. Isn't she just fabulous?! The Space Woman is on the left, wearing what appears to be a micro-mini skirt. 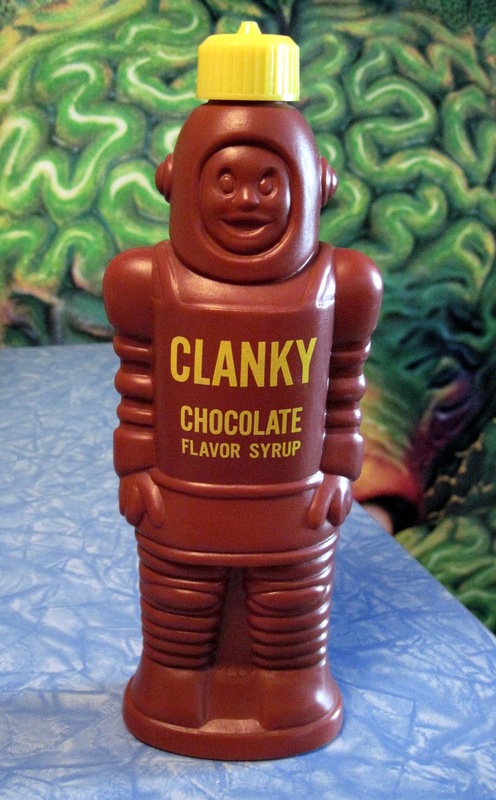 The space race of the 1950s and '60s resulted in all sorts of fabulous interstellar themed products for children ranging from toys to snack foods, including some like Clanky that were a little bit of both. 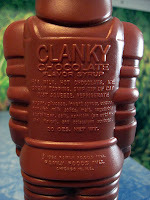 "We love Clanky, Clanky the Spaceman. He can do a lot of things nobody else can! And he makes our milk all chocolatey. 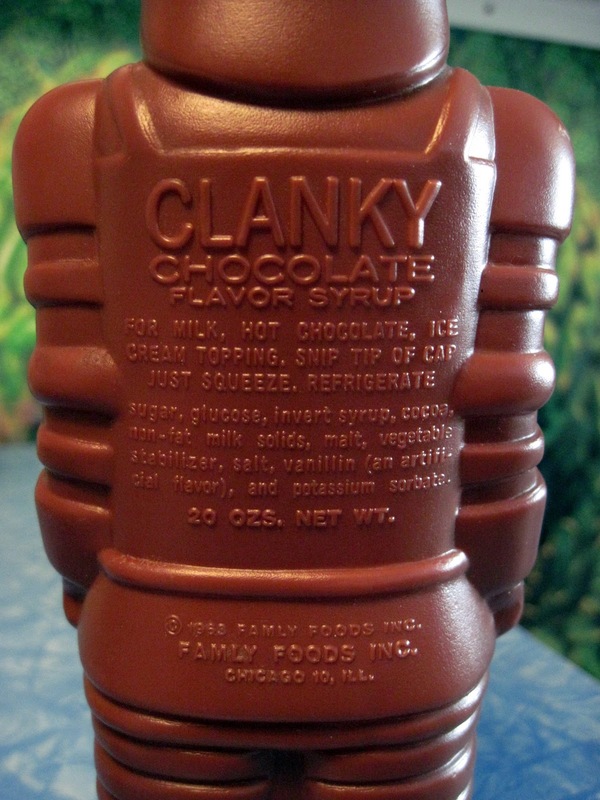 Clanky's ingredients: a little bit of stardust and a whole lot of sugar. 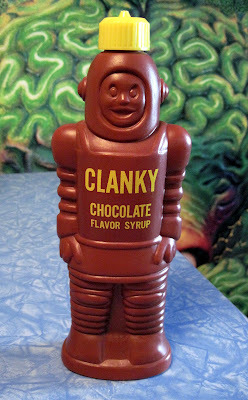 Today Clanky serves as a great example of vintage space race product tie-ins, and he looks fab smiling from a shelf full of related toys. Wheeeee!!!! I'll post everything soon. There were a couple of long-sought space toys in the haul, and, as you can see, it was a Trollapalooza. 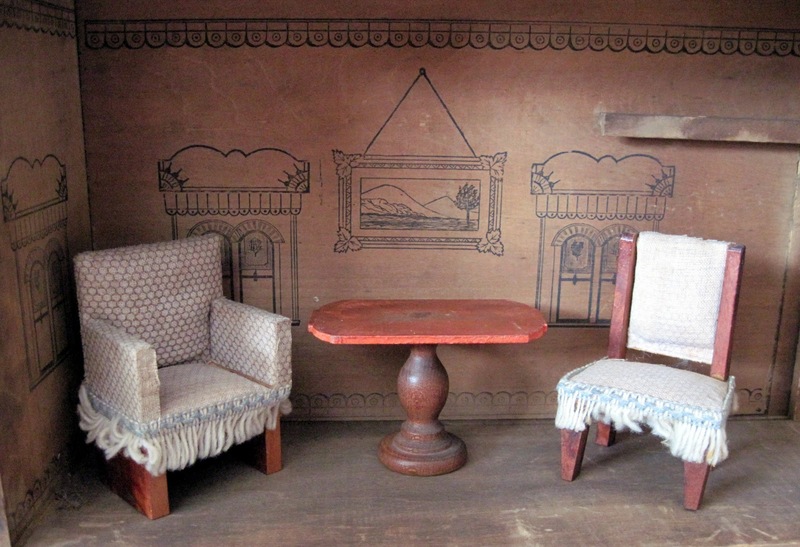 I received one of my most unusual dollhouses as a Christmas gift this past year. 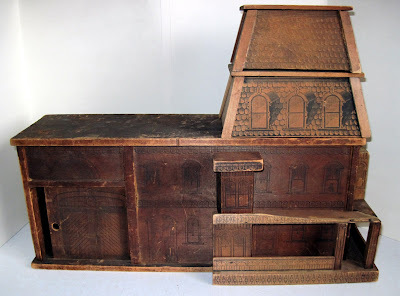 American made and dating from the 1890s to early 1900s, the 17 inch long house features detailed decoration lithographed directly onto the wooden surface. It appears to have been made as a travelling dollhouse, as the pieces disassemble and pack neatly inside for storage and transport. I've never seen anything quite like it, and can't find anything similar in any of my dollhouse books. 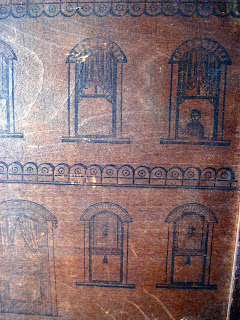 The house has a lot of play wear, but it was so unique, I couldn't pass it up. where he seems to welcome us to his house. 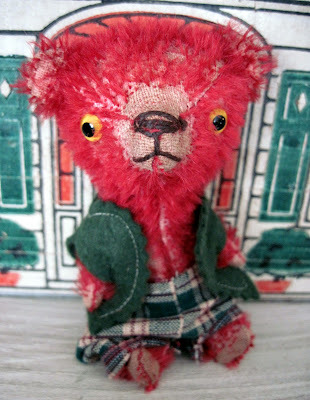 Meet Mr.Cranberrie, a wee little four inch ted made by bear artist extraordinaire Peng Peng. 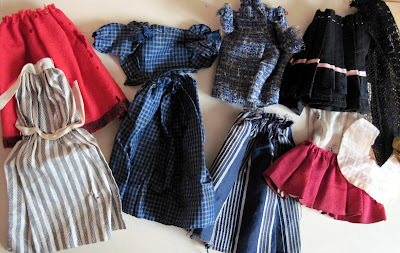 (She made his tiny outfit, too!) 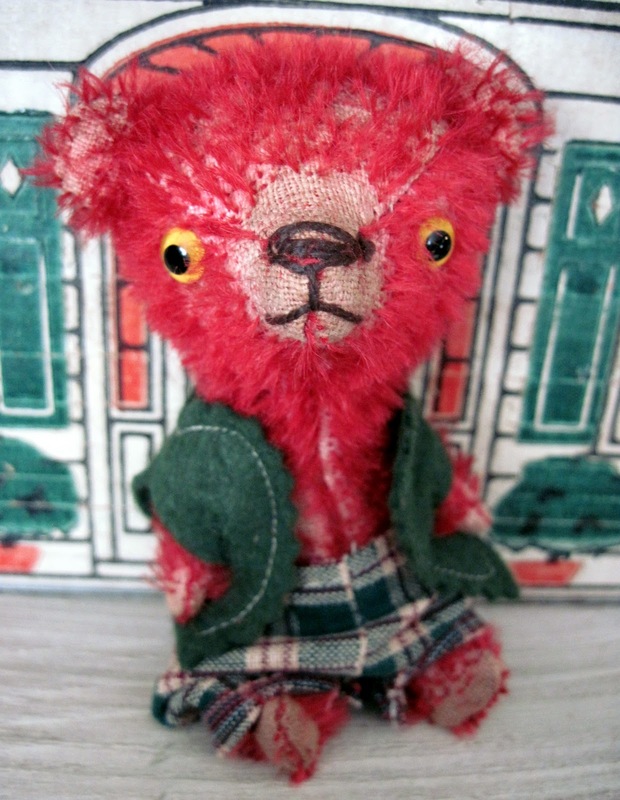 This very Christmasy-looking bear was, in fact, a holiday gift this year. 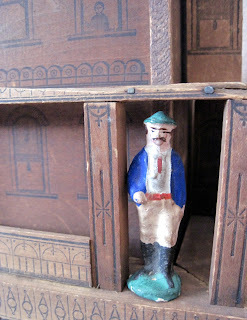 Mr. C. is pictured sitting on a dollhouse porch. This beautiful 1880s toy was one of my favorite Christmas presents this year, acquired from a collection I appraised in the autumn. 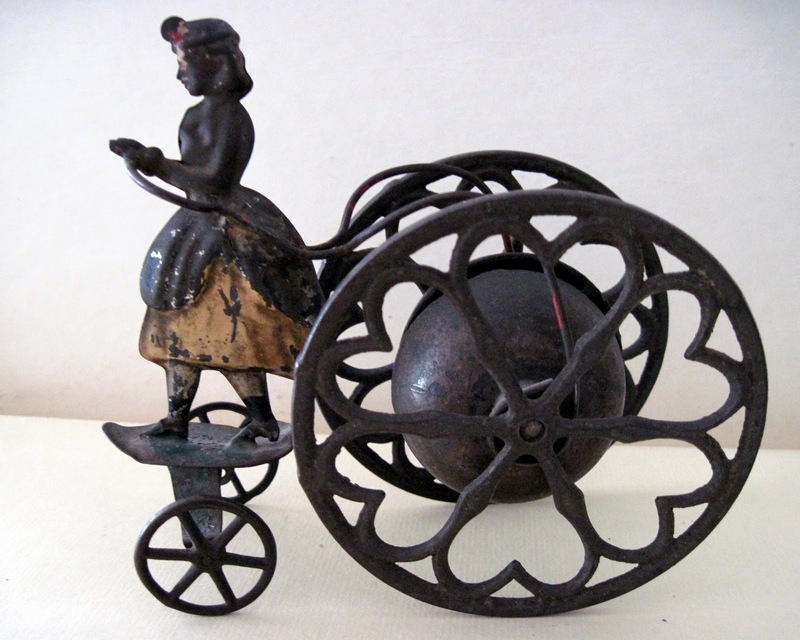 Made of cast iron and pressed tin, a melodious chime rings as the 5 inch tall toy is pulled. 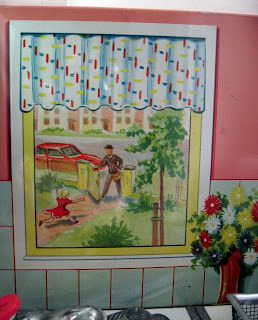 The little girl at the front is made of tin (is she skipping rope?) 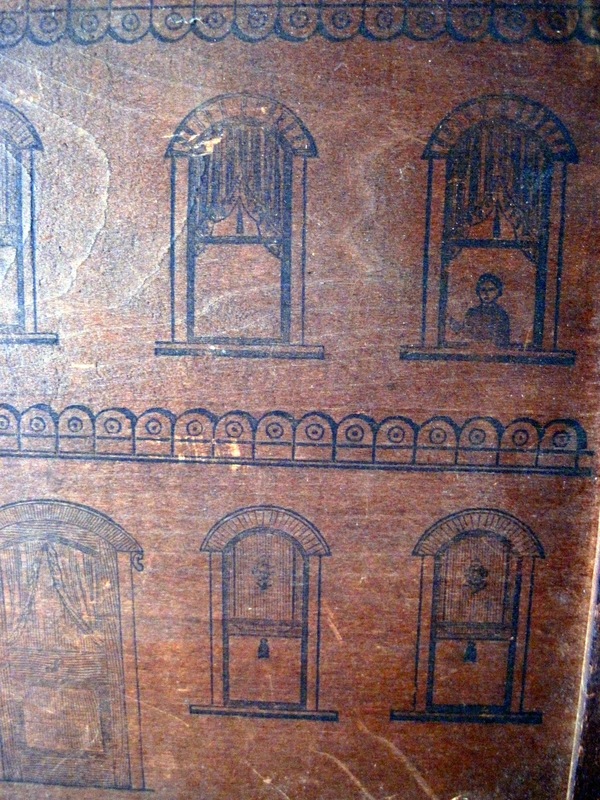 and retains some of her original paint. 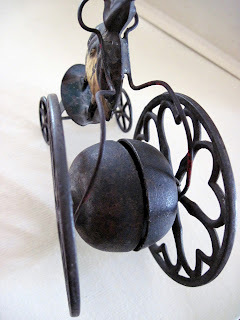 The cast iron wheels hold a bell between them. Toys like these were made by American companies such as Fallows of Philadelphia; Althof, Bergmann of New York; and Gong Bell of Connecticut throughout the mid to late nineteenth century. The cast iron assembly holding the chime bell. Oh, I just love love love these sorts of toys: homemade, much-loved things that have been kept together for a century (or more!) and come with information about their original owner. This was another of my favorite Christmas gifts. 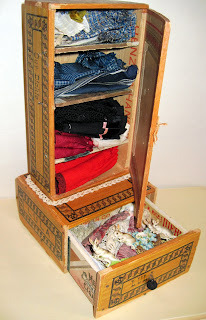 This wonderful dolly's armoire was made from two cigar boxes, probably by a father or grandfather. 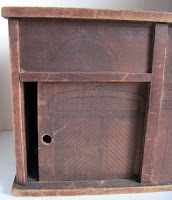 11 inches tall, the armoire still retains many of its original cigar labels, including one with a patent date of 1886. 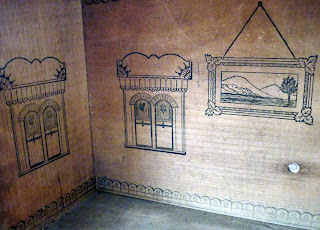 The decoration on the outside of the box was applied, and consists of antique paper which gives an appearance of marquetry. 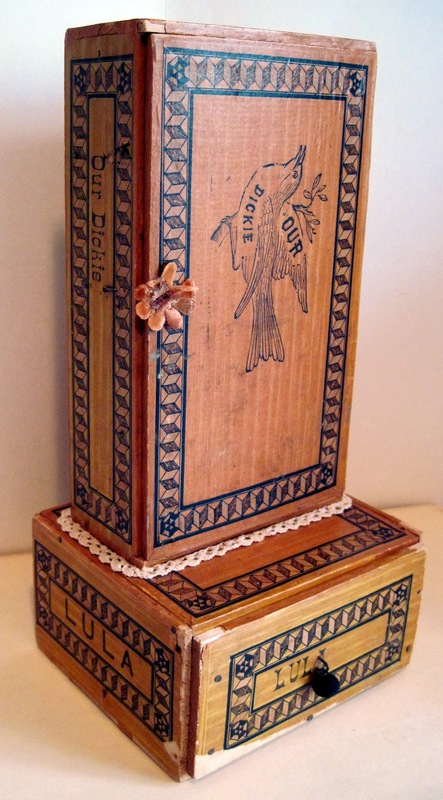 The words on the armoire seemed rather cryptic, but research revealed "Our Dickie" was a pet name used for the pictured canary bird in the 1890s, while "Lula" was a popular girl's name at the same time. The inside shelves, with original cigar box labels. According to the pencilled note on the back of the armoire, this belonged to a little girl named (as nearly as I can decipher) Dorthea Sison, who lived in Maryville, Missouri, a town founded in 1845 in Nodaway County. 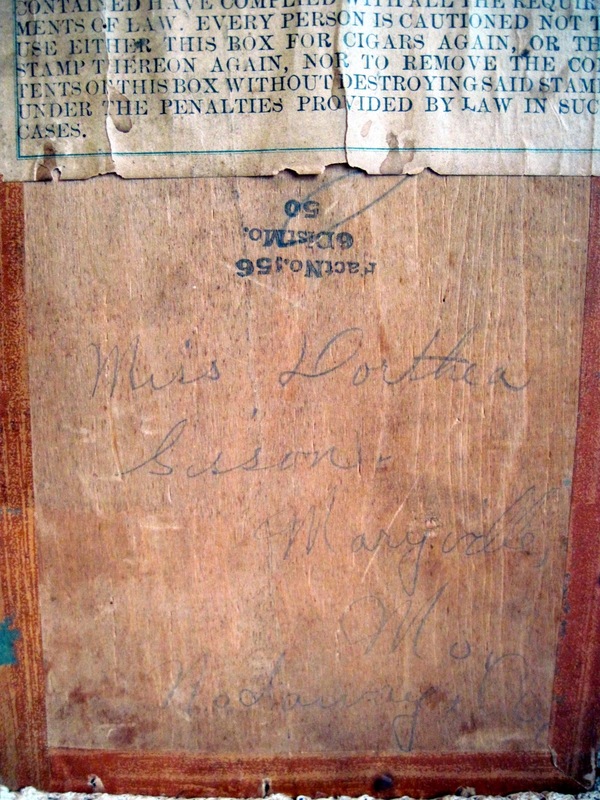 Still more historical information was found inside the armoire. 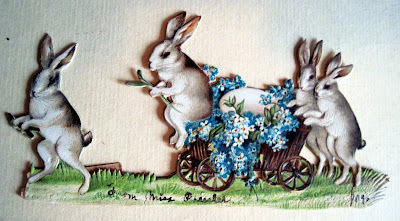 Written on a beautiful Victorian Easter scrap were the words: "From Miss Pressler 1890." 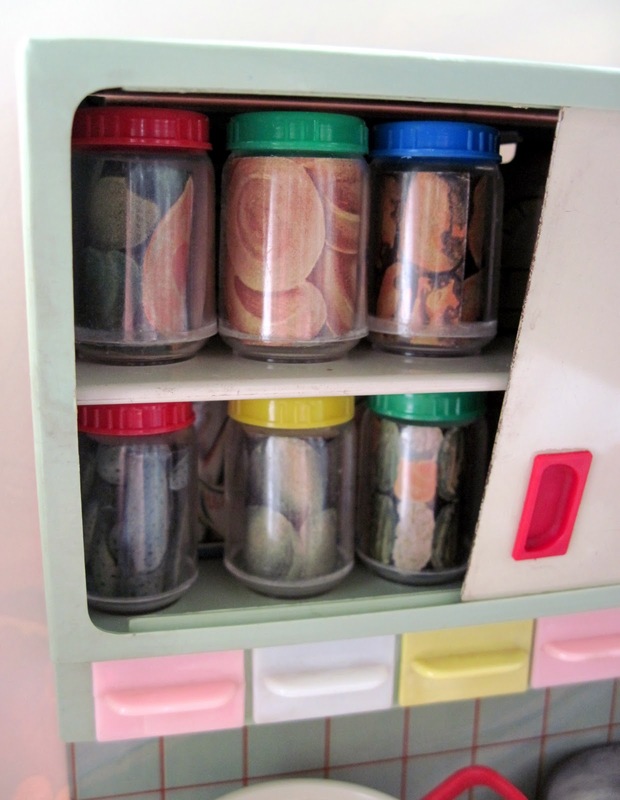 My heart skipped a beat when I slid open the drawer to reveal this! Dorthea made an entire wardrobe and even some accessories for her little doll, including red silk bloomers, a matching laundry bag, several blouses, two lace dresses, a cape, a blue tweed coat, a pillow, and even a tiny belt made from an orange ribbon and an itty bitty buckle. A second set of clothes in a larger size appear to have been made for a companion doll who is now, sadly, missing. 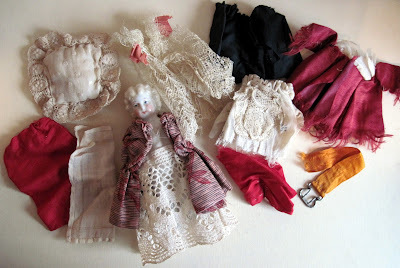 These pieces include a feedsack apron and a black lace mourning veil. 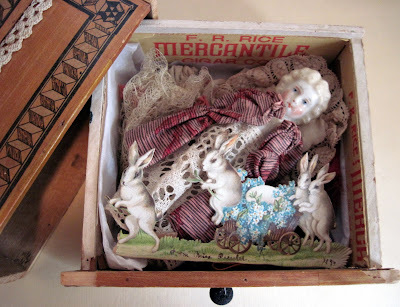 Somehow, this small lot of much-loved toys made their way from Missouri to an estate sale in New Hampshire, and from there, to an antique doll dealer in metropolitan Detroit before coming home with me. Quite a journey for such fragile toys! I plan to keep them together for the rest of my life, but who knows where Dorthea's dolly may travel to then? We spotted these two little wind up doggies at an antique flea market just before Christmas. 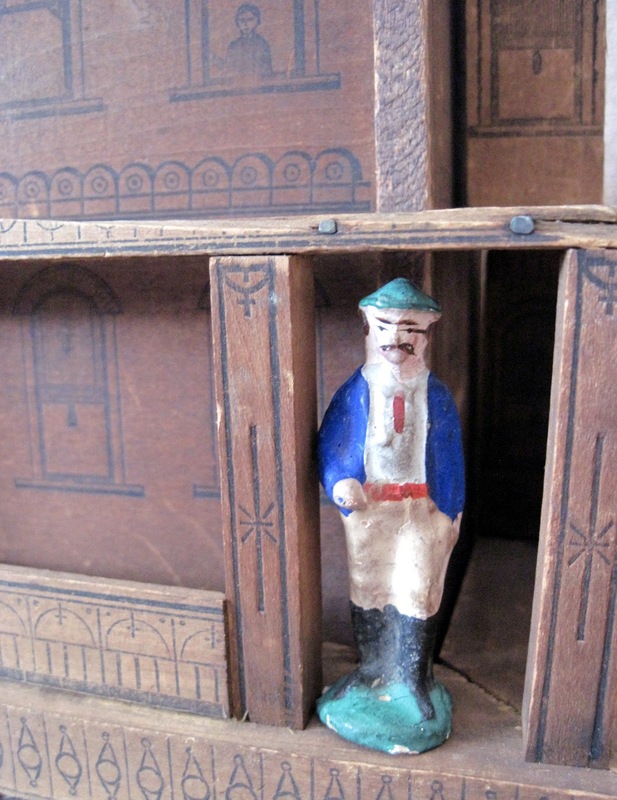 Probably German and circa the 1930s, they measure 4 and 1/2 inches long. 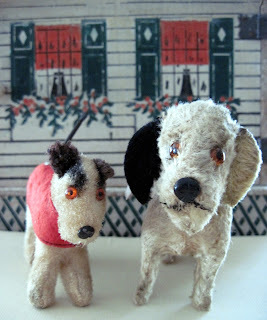 When their keys are wound, their tails spin in wild circles, while the ears on the larger dog flap back and forth in spectacularly comic fashion. 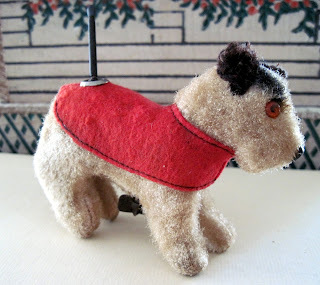 The littlest dog wears a red felt sweater. He reminds me of Asta, Nick and Nora Charles' dog in the Thin Man movies. 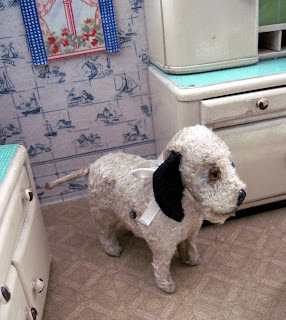 The doggies are just the right size to hang out in my doll kitchen.